In June my mom came down to help me sew all the bedding for the nursery. I'm so glad that she did because I really don't think I could have done it all myself. Or I should say I probably could have managed it, but in no way would it look as good as it does without her help. 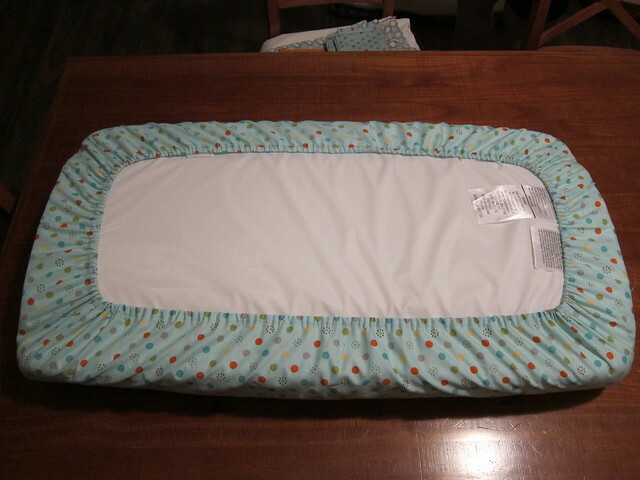 Our first project was to make two changing pad covers. I think it's funny that this was the one that she balked at the most because it's basically a fitted sheet and we all know that we hate those. This was seriously the easiest one and I could probably make 20 of them like a pro! 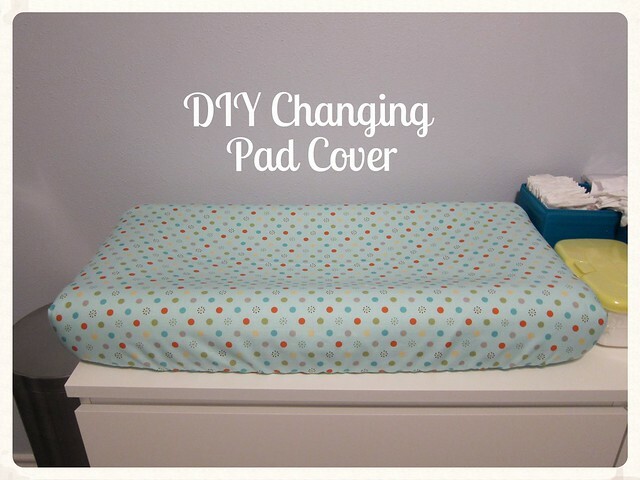 To fit a standard changing pad (32″L x 16″W x 4″H) you'll need to cut your fabric to 48" x 32". 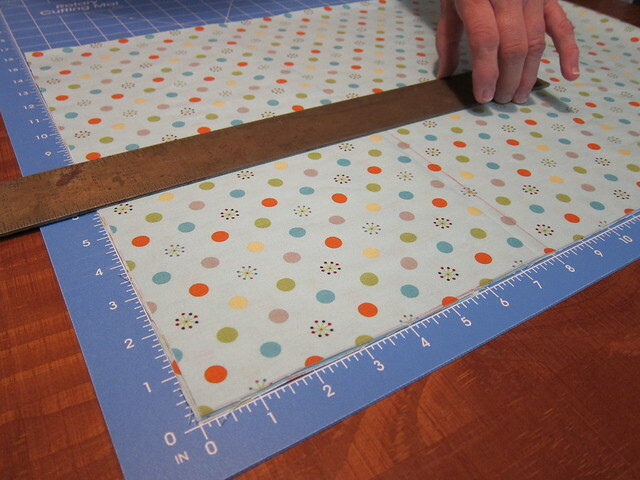 Next fold your fabric lengthwise and then widthwise and cut an 8" x 8" square from the raw edges of your fabric. Note: Using your husband's tools is also totally acceptable for any major sewing project. 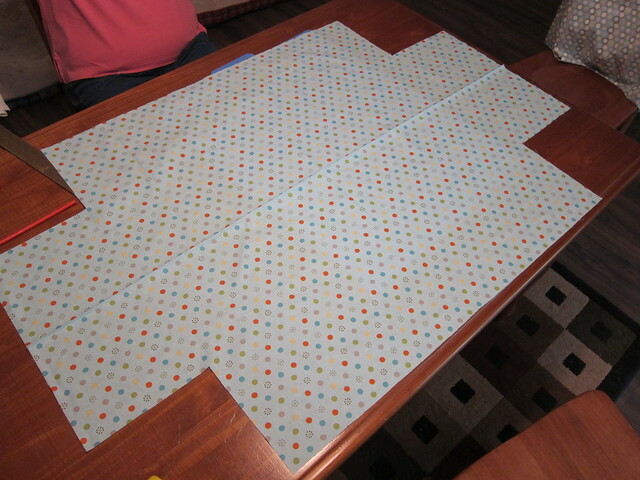 This is what your piece of fabric will look like after you make the cut and lay it out. 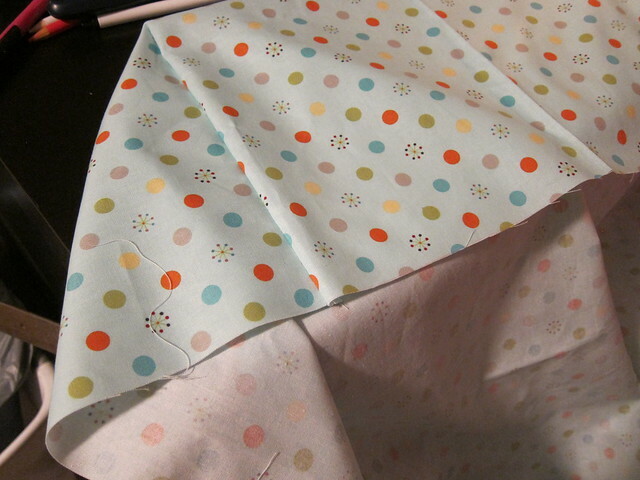 Next pin the corners together with the right side of the fabric facing each other. Sew your four corners together. Next you'll need to create a tube for the elastic. Do this by folding over about a 1/2 inch of fabric, pressing with an iron and then folding over another inch and pinning in place. 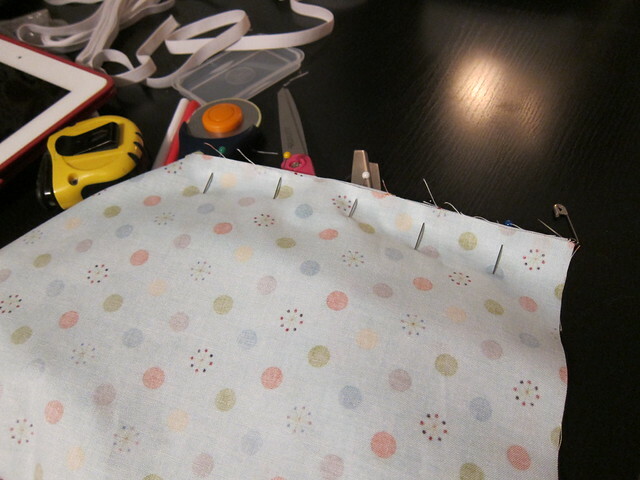 Be sure to leave yourself an opening to feed your elastic through and then sew your seam. Cut a 36 inch piece of elastic - we used 3/8 inch - and using a safety pin, feed your elastic through the tube you just sewed. 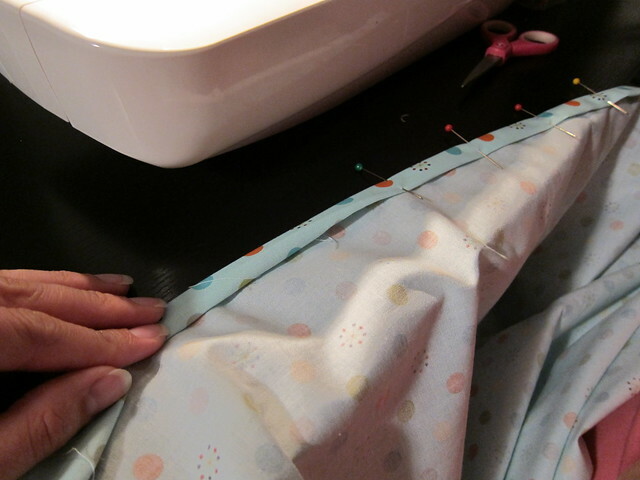 You'll want to sew your elastic together and then sew your opening closed. The end result should basically look like a giant shower cap! 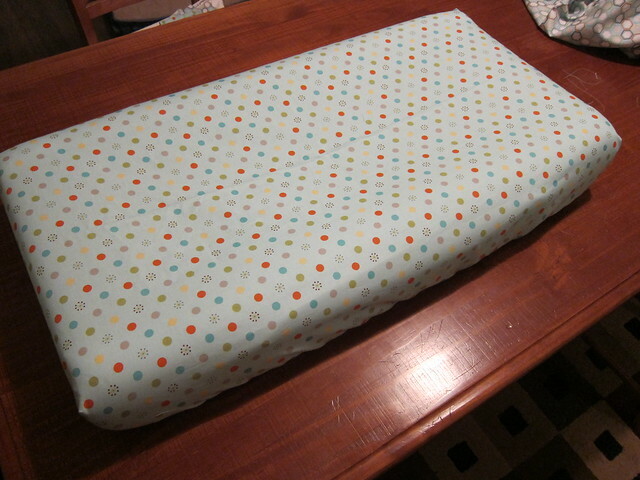 Also a view of the fabric we used for the second pad cover. Here it is on the pad from the back. It looks AWESOME, Faith! I can't wait to see what else you gals did! Let me know I you do! 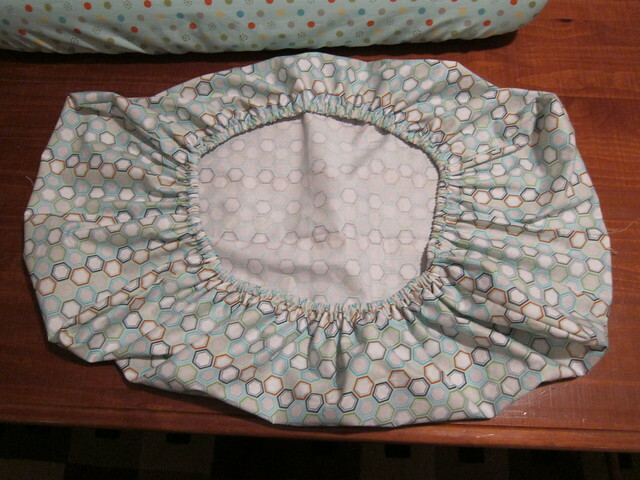 I'm almost tempted to make another because I have so much left over fabric. They don't take a lot of time to whip up. I've only ever sewed PJ pants. This one was super easy though, any beginner could do it. You are so fancy! I just used king sized jersey pillow cases.